What were you like as a teenager? I was a nightmare. I was rude to my parents, always stayed out late, never did my homework, hung out with the wrong people and made lots of bad decisions. Apparently, this is the age when teenagers are out of control and behave badly. Maybe, if you're a teenager now, you think this is unfair criticism or it's not your fault. Well, you might be right! Experts have found that it's a teenager's brain that is to blame. Between the ages of approximately 13 to 19 - a period known as adolescence - the brain is still developing in areas that control behaviour. This has an impact on learning and multitasking, stress and memory, sleep, addiction, and decision-making. For parents, these consequences often manifest themselves in a variety of behaviours that they may have previously blamed on hormones or just moodiness. This is quite a new discovery, according to Professor Sarah-Jayne Blakemore, who, speaking on the BBC radio programme The Life Scientific, says "when I was at university, the dogma in the text books was that the vast majority of brain development goes on in the first few years of life and nothing much changes after mid-childhood. That dogma is completely false." So our brains are still developing much later than was originally thought. Is this the perfect excuse for teenagers to lounge around and not get their homework done on time? Of course not! According to Professor Sarah-Jayne Blakemore, it's to do with our prefrontal cortex – that's the part of our brain right at the front, just behind the forehead. She says "it’s involved in a whole range of very high-level cognitive tasks such as decision making and planning - we know that this region is undergoing very very large amounts of development during the adolescent years". This is the part of the brain critically involved in planning, and, for a teenager, this hasn't developed yet. So getting organised to do their homework, for example, can come as a bit of a challenge. I wish I’d known about this because instead of telling my teacher I’d left my homework on the bus or that the dog had eaten it. Now I could say, "Sorry sir, my brain isn’t developed enough for the cognitive task of planning my homework". 1. During adolescence, what is thought to be happening to the area of the brain that is controlling behaviour? 2. How have ideas about early brain development changed? 3. What tasks does the prefrontal cortex part of the brain affect? 4. True or false? It's hard for teenagers to get organised because the part of the brain needed to do this is still developing. 5. Which word used in the article means 'to become clear through signs or actions'? 1. Our journey was a ______. First we got stuck in a traffic jam and then our car broke down! 2. It's ______ important that we sign the contract today, otherwise we will lose the business. 3. We're blaming our son's behaviour on his ______; it can't be anything else can it? 4. I've got a day off work today so I'm just going to ______ and watch TV. 5. Some businesses feel the pressure to change smoking laws has been driven more by ______ than hard facts. 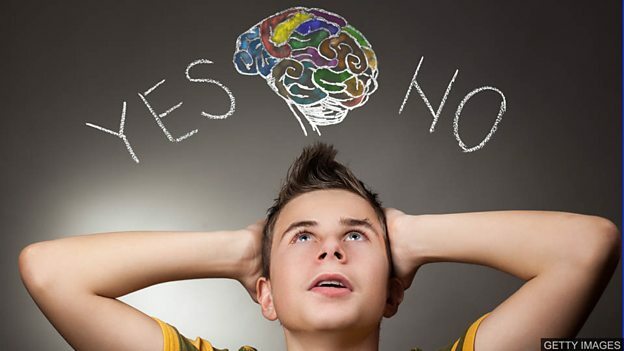 Between the ages of approximately 13 to 19, the brain is still developing in areas that control behaviour. They have changed from thinking that the vast majority of brain development goes on in the first few years of life and nothing much changes after mid-childhood, to the idea that brain development continues through adolescence. It affects us performing cognitive tasks such as decision making and planning. True. The prefrontal cortex is the part of the brain critically involved in planning, and, for a teenager, this hasn't developed yet. So getting organised to do their homework, for example, can come as a bit of a challenge. The word is 'manifest'. "For parents, these consequences often manifest themselves in a variety of behaviours that they may have previously blamed on hormones or just moodiness." 1. Our journey was a nightmare. First we got stuck in a traffic jam and then our car broke down! 2. It's critically important that we sign the contract today, otherwise we will lose the business. 3. We're blaming our son's behaviour on his hormones, it can't be anything else can it? 4. I've got a day off work today so I'm just going to lounge around and watch TV. 5. Some businesses feel the pressure to change smoking laws has been driven more by dogma than hard facts.